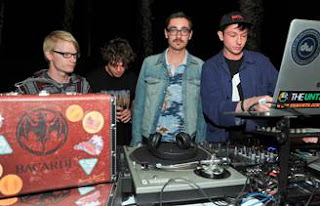 CALIFORNIA, April 2013: Following their successful hit on the soundtrack for Oscar-winning Silver Linings Playbook, British indie rock band Alt-J continue to set alight the music world with an electrifying DJ set, at BACARDÍ’s Coachella after party. The 2012 British Mercury Prize winners DJ’d at the exclusive after party, which was attended by some of the industry’s hottest names including: Foals, Grimes, Twin Shadow, DJ Whitney Fierce, Jamie Jones, La Roux. Set within the striking backdrop of the Californian desert, guests including Foals were brought to the party in style. BACARDÍ over the past 150 years has been bringing the good and the great to its parties, and this party was no exception. VIP guests arrived in retro 1950s classic Cadillac cars, ensuring they made a true Hollywood entrance. This exclusive web video features interviews with Alt-J and Foals, talking about the music industry as well as their performance at the festival.